When the time comes to end the connection, you may have some problems. Fish are extremely sensitive and easily offended. But if you collect all the determination and courage at the right time, the case can be brought to completion. Here are some recommendations that are best to follow. Do not pay attention to Pisces, while in the company, interrupt them during a conversation, make fun of them. Become a debater, do not pay attention to how you are dressed, try to play a leading role in the conversation, not giving them the opportunity to express their own opinion. Do not praise them and hint that they should be corrected. For example, recommend changing the hair color. Return all their gifts to the store. Be avaricious in handling money. Scold Pisces for any trifles. Be intolerant of mistakes, deny their old-fashioned values. Soon the Pisces will become closed and gloomy. In this mood, they have nothing left but to seek spiritual comfort on the side. 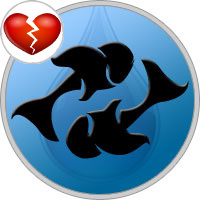 As the horoscope of parting says, for a Pisces woman, breaking the love relationship is a huge problem. First of all, they are never sure whether they made the right decision. So just in case the Fish do not say the last, final word and always leave the door open, preparing a loophole for themselves. Often Pisces develop relationships on the side and then shift the severity of their breakdown onto the second half, betrayed by them. The stars say that after parting Pisces show a tendency to return to their former in emergency situations. Abandoned Pisces is another matter. They are amazed and indignant at the fact that someone has done something behind their back. They begin a "thought marathon" and eventually come to the conclusion that they are worthless, that the gap is their fault. The initial anger turns into despair and self-flagellation. Are Pisces Taking revenge? Yes, but their revenge can be exhausted by the fact that they will irritate the partner with a detailed clarification of the relationship and attempts to evoke in him a sense of guilt. Pisces is easy to convince of anything, the main thing is to get down to business with affection. This sign is inclined to mysticism and self-sacrifice, so he can be persuaded that some higher forces require separation. This sign works best either with strong, independent natures, behind which the gentle Pisces feel safe and can admire their idol, or with the miserable and unhappy ones, which must immediately be taken care of while at the same time instructing them on the true path. If you do not belong to any of these categories, you will quite easily get rid of your Pisces, pointing out the desired object to them and convincing them of their ordinary, limited and incapable of understanding the higher matter. The only thing that you can not do at all when parting with Pisces is to try to get them to objectively assess the situation and themselves.